Place 4 foam washers on 4 1/2" wide head screws. Flip lid upside down and stack... Foam seal, then LCD clear window (remove Protective coating from both sides) and finally the LCD Window Brace (remove protective coating). Place the 4 - 1/2" Screw through the lid with the foam washer on the outside. Compress foam and thread the 4- Hex Standoffs. Tighten each one hand tight compressing the foam. Mount the water resistant button switch to the enclosure lid. Do not over tighten seal, if squeezes out of place the button is too tight. Test enclosure lid again for water tightness. Spray water around the LCD window and button and ensure water does nor leak to the back side of the lid. Adjust as necessary. Using 4 - 5/16" wide head screws. Mount LCD module to the lid. Connect the 3 pin cable to the LCD module. Strip wires about 1/2", fold in half stripped wire and screw into the switch screw lugs. Connect 4 pin connector to LCD note the color that represents Ground (Green as pictured). Your Charging station can be built with AC input Left and J1772 Right or opposite. Flip mounting plate to desired position. Fuses will line up with AC input and relays J1772 cable. Position relays so the small tabs are to the outside for easier routing of low voltage wires. Mount OpenEVSE Plus board with 5/8" screws from the top. 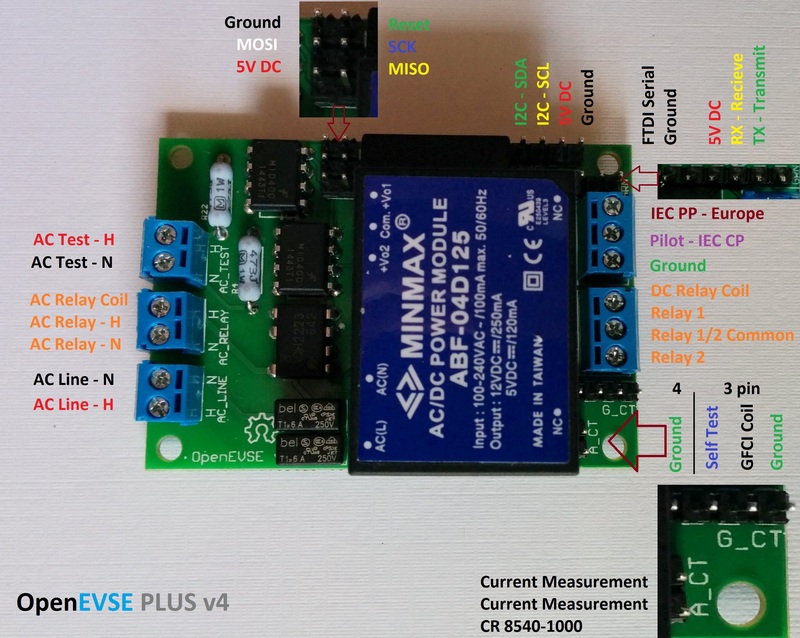 Connect OpenEVSE Ground to the ground Block. Ensure connections are secure. Screw the 22AWG wires to the "AC Line - N" and "AC Line - H" block on the OpenEVSE board. Mount Plate into enclosure base with 4 to 6 screws. One Hot conductors should be about 5" long and the other slightly shorter. Crimp Yellow QC connectors to the Hot Conductors AND a 22AWG wire for the AC Test connections. Hot conductors should be 2" long. Run both HOT lines through the GFCI coil. Connect the 22AWG wires from the QC connectors on the J1772 cable to the "AC Test - H" and "AC Test - N" to the OpenEVSE board. Connect the Control Pilot from the J1772 cable to the OpenEVSE board. Each manufacture uses different color codes for pilot. IT/Leviton - Orange, Yasaki - Blue, Quick Charge Power - Purple. Connect 4 pin LCD cable to the OpenEVSE board. Ensure the Ground from LCD connected to the ground on OpenEVSE board (ground is closest pin to board edge). Colors of 4 pin connector varies and may not be the same as the image. Connect the GFCI coil with self test loop to the 4 pin connector. Orange Self test wires to the inside Black GFCI CT wires to the outside. Value kit - Set "Backlight Type" to Monochrome. Menu => Setup => Backlight Type. Set Current to desired Value. 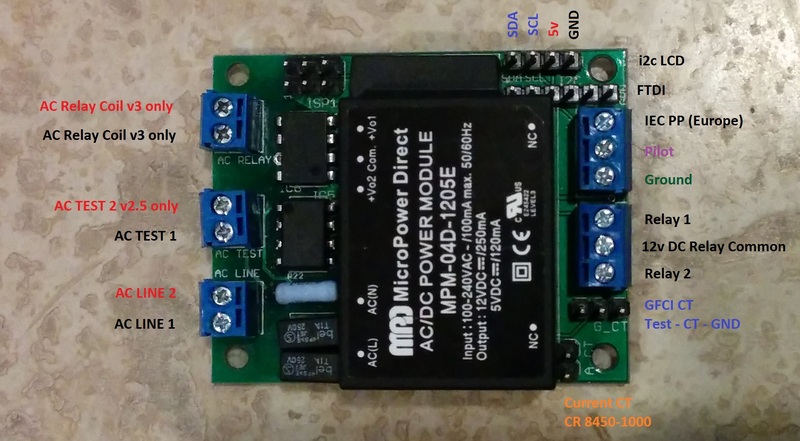 Menu => Setup => Max Current. If you are re-using the J1772 cord from a Chevy Volt Level 1 EVSE (2012, made by Lear) , the Pilot lead is black with a purple stripe. The gray with purple stripe lead is for the LED in the handle. Connect it in series with a resistor ( I used a 360 ohm, 1/4 watt) to the common relay output pin, which is a constant 12 volts. I'm totally lost at this point - I bought the J1772 cable from this site to install and it has 7 wires - not the 5 listed in the guide. It has 2 red wires and 2 black wires - do I need to tie them together into one? Also, where goes the ground wires attach to this - do they just go into wherever there is space on the grounding bar?